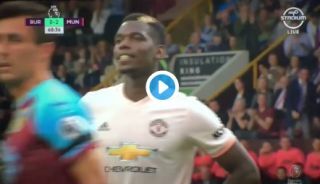 Paul Pogba missed a penalty for Manchester United against Burnley today, with his tame effort saved by goalkeeper Joe Hart. See the video below as it’s little surprise the France international couldn’t find the back of the net at Turf Moor with this poor effort. Hart made easy work of it, and Jose Mourinho showed little emotion with his reaction, which is also included in this video in the tweet below. Much has been made of the relationship between Mourinho and Pogba at United, and he can’t have been too happy with this, even if United still have two-goal lead at the time of writing.